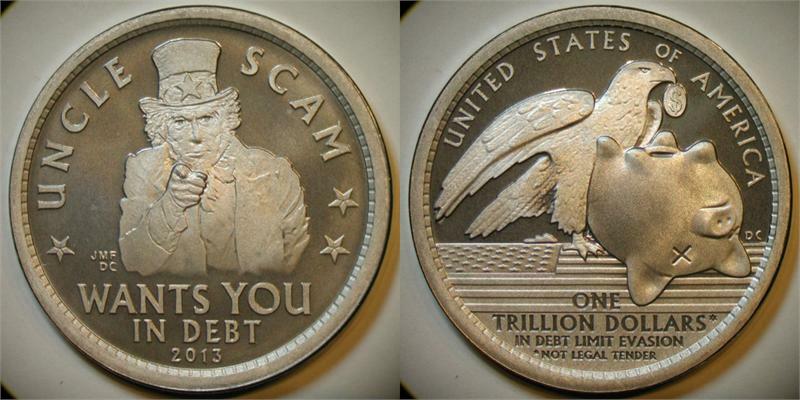 The Trillion Dollar Coin: Joke or Game-changer? Economist and NY Times columnist Paul Krugman responded with a critical blog post accusing Stuart of a “lack of professionalism” for not taking the trillion dollar coin seriously. However, Krugman himself had called the idea “silly.” He thought it was just less silly — and less dangerous — than playing with the debt ceiling, which was itself an unconstitutional shackle on the Treasury’s ability to pay debts already incurred by Congress. It’s all good fun – or is it? Most commentators have missed the real significance of the trillion dollar coin. It is not just about political gamesmanship. For centuries, a secret battle has raged over who should create the nation’s money supply – governments or banks. Today, all that is left of the US Treasury’s money-creating power is the ability to mint coins. If we the people want to reclaim that power so that we can pay our obligations when due, the Treasury will need to mint more than nickels and dimes. It will need to create some coins with very large numbers on them. To bail out the banks, the Federal Reserve, as head of the private banking system, issued over $2 trillion as “quantitative easing,” simply by creating the money on a computer screen. Congress, the White House, and the Treasury all rolled over and acquiesced. When it was proposed that the government bail itself out of its budget woes by minting a $1 trillion coin, the Federal Reserve said it would not accept the Treasury’s legal tender. And the White House again acquiesced, evidently embarrassed to have entertained this “ludicrous” alternative. The banks obviously have the upper hand in this game; and they’ve had it for the last 2-1/2 centuries, making us forget that any other option exists. We have forgotten our historical roots. The American colonists did not think it was silly when they escaped a grinding debt to British bankers and a chronically short money supply by printing their own paper scrip, an innovative solution that allowed the colonies to thrive. We have lost not only the power to create our own money but the memory that we once had that power. With the help of such campaigns as Occupy Wall Street, Strike Debt, and the Free University, however, we are starting to re-learn the great secret of money: that how it gets created determines who has the power in society — we the people, or they the bankers. We may rail against the banks and demand change, but nothing will change until we grasp their fundamental secret, the foundation of their power: that those who create the nation’s money control the nation. By mechanisms explained elsewhere, nearly the entire money supply today is created by banks. Benjamin Franklin was called called “the Father of Paper Money.” He argued before the British Parliament that government-issued money had allowed the colonies to escape the yoke of debt, to thrive and grow. The king, urged by the Bank of England, responded by forbidding all new issues of paper scrip. The colonial economy then sank into a depression, and the colonists rebelled. They won the revolution, but the power to create money was lost to a private banking oligarchy modeled on the one dominated by the Bank of England. Fourscore and six years later, President Abraham Lincoln boldly took back the money power during the Civil War. To avoid exorbitant interest rates of 24% to 36%, he decided to print money directly from the US Treasury as US Notes or “greenbacks.” The issuance of $450 million in greenbacks was key to funding not only the North’s victory in the war but an array of pivotal infrastructure projects, including a transcontinental railway system. Bank-created money (which now includes electronic money) could be rented at a profit to the people. The “people’s money” was limited to coin, which today composes less than one ten-thousandth of M3, the broadest measure of the money supply. Lincoln’s assassination and the abandonment of debt-free greenbacks effectively marked the exchange of one type of slavery (race-based) for another (wage- and debt-based). As a result, the American government and American people are so heavily mired in debt today that only a radical overhaul of the monetary system can free us. The idea of minting large denomination coins to solve economic problems was evidently first suggested by a chairman of the Coinage Subcommittee of the U.S. House of Representatives in the early 1980s. He pointed out that the government could pay off its entire debt with some billion-dollar coins. The Constitution gives Congress the power to coin money and regulate its value, and no limit is put on the value of the coins it creates. In Web of Debt (2007), I suggested that to solve the government’s debt problems today these would need to be trillion dollar coins. In legislation initiated in 1982, however, Congress chose to impose limits on the amounts and denominations of most coins. The one exception was the platinum coin, which a special provision allowed to be minted in any amount for commemorative purposes. Joe Firestone pointed out that the trillion dollar coin could solve the government’s debt problems once and for all, putting was in its grasp the power to replace austerity with the abundance enjoyed by our forefathers. Prof. Randall Wray explains that the coin would not circulate but would be deposited in the government’s account at the Fed, so it could not inflate the circulating money supply. The budget would still need Congressional approval. To keep a lid on spending, Congress would just need to abide by some basic rules of economics. It could spend on goods and services up to full employment without creating price inflation (since supply an d demand would rise together). After that, it would need to tax — not to fund the budget, but to shrink the circulating money supply and avoid driving up prices with excess demand. The current economic crisis cannot be solved with the thinking that created it. There is simply not enough money in the system to fund the services we desperately need, pay down the debt, and keep taxes affordable. The money supply has shrunk by $4 trillion since 2008, according to the Fed’s own website. The only solution is to add more money to the real, producing economy; And that means some congressionally-mandated entity needs to create it, either the Fed or the Treasury. The Fed has declined. In flatly rejecting the Treasury’s legal tender, the Fed as representative of the banks is asserting itself as outranking the elected representatives of the people. If the Fed won’t acknowledge the coins created by the government, perhaps the government needs to charter a publicly-owned bank that will. Ellen Brown is an attorney and president of the Public Banking Institute. In Web of Debt, her latest of eleven books, she shows how a private banking oligarchy has usurped the power to create money from the people themselves, and how we the people can get it back. Her book The Buck Starts Here: Restoring Prosperity with Publicly-owned Banks will be released this spring. Her websites are http://WebofDebt.com, http://EllenBrown.com, and http://PublicBankingInstitute.org. Pay attention. Since Congress has authorized the coins under the cover of commemorative coins but failed to specify a denomination for them it made possible a coin denominated at a trillion dollars. This is pre-approved money. So what happens if the President deposits several of these coins with the Fed. It give the President power to finance his executive orders from that fund — without having to go to Congress. The most centralized absolute power of all time. Furthermore all of you are wrong about there being monetary inflation. Students of economics should know that in a deflation not only typical industry demand curves shift left, but supply curves shift left — and that is what is happening — so that we can and obviously do have consumer good price increases in deflation. Different elements of the vicious circle of the deflationary spiral shift either demand or supply. Ellen Brown also wants the Fed made more powerful. She fits right in with Steve Keen and Michael Hudson. Yes, the T$ coin can be done and also US Notes, printed and spent by the government in very recent history, could be used to pay the nation’s bills. Many of those US notes (the ones with the red serial numbers) were in circulation in the 50s and 60s and the money supply was more stable and the economy was stronger. It can be done again. Daniel Carr, Where can you buy these? I’ve sent my detailed objections to Ellen Brown and Michael Hudson — and my critiques of the economics of Brown, Keen and Hudson. They weren’t interested in them and you wouldn’t be either. Moonlight Mint is the manufacturer. They can be found on the internet. A few brass ones are still available. The pewter, copper, and silver versions are no longer available from the original minter. The problem with using a $Trillion coin to pay off the existing debt, is that the securities held a the Fed have already had their debts to the banks paid off by the Fed buying them with money it created out of thin air. The securities at the Fed are “live” (they can still be sold, exchanged for dollars), but because a security does not have on it the name of the person/institution owed, but simply “pay to the bearer”, and the fact that the Fed is a government agency, meaning it cannot be owed for creating the money with which it bought the security, it does not represent an active debt of the government to anyone. Government doesn’t owe itself here. The Fed will likely hold mature securities until there is inflation. Then it will go to the Treasury and swap the mature securities for new ones. No ‘money’ changes hands, and this is legal (so says a document put out by the Chicago Federal Reserve Bank, “Modern Money Mechanics”). The Fed will sell these new securities (with future redemption dates) to banks to drain their reserves, curtailing some of the lending to get control of inflation. Taxes can also be raised, imports encouraged, savings encouraged to fight inflation, interest raised. The point is, if the securities at the Fed do not represent live debts, they should not be counted in the debt ceiling calculations. Furthermore having the Treasury buy the with a $10 Trillion coin represents a second buying of a debt already cancelled. There is no Congressional authorization for that. Other so-called debts are to the investors and foreign governments that have bought Treasury bonds and securities as safe investments with nominal interest. The Fed usually manages these sales (I understand) and it has the power to create whatever money is necessary to pay them back in full (e.g. w/ added interest). These a time deposits like bank CD’s. They are not used in funding the government’s operations. Those are funded by other securities created by the Treasury and sold to banks for raising money for deficit spending. As for the the debt ceiling: Here I will ultimately defer to the lawyers, but isn’t it unconstitutiona? Article 1 Sec. 8 of the Constitution says that Congress has the power to pay the debts … of the United States. The debt ceiling curtails and limits that power. Can Congress limit any of its powers given it in the Constitution? If so, it can limit and deny anything in the Constitution, which obviously it can’t. I believe you missed the point. The T$ coin was to pay government bills, circumventing the debt ceiling, not for paying off the debt. It is the same process that occurs everyday by minting coins. It is just a matter of minting a coin marked “1T$” rather than “nickle and dimeing”. When the Fed buys the securities from the banks with money created out of thin air, it is not lending the money to the banks at interest. It is crediting the banks for the face value of the securities. We have a fiat money system and the Fed is the governmental entity that creates large amounts of money out of thin air at a time. It issues credit not debt. Only by denying that the Fed is a government entity using government created money can you make the Fed be owed for buying the securities, because it would then have to draw on private banking reserves. But Bernanke and others have said that the Fed simply credits bank reserves by a digital entry in their reserve spreadsheets at the Fed. Or he says, “It draws on itself” Only by using government powers to create money granted to Congress and delegated to the Fed can these unlimited purchases of securities be done. Ellen Brown also wants the Fed made more powerful in the blind faith that the Fed will use this power to drop helicopter money. Why should it. Why would nationalization of the Fed suddenly render the policy makes angels caring for the people? It would not. Ellen Brown, Steve Keen and Michael Hudson see nothing wrong with giving “thin-air” money creation to Congress so that Congress can spend money into existence on “infrastructure” — anyone advocating that is dangerous. Very insightful indeed.. thanks for posting!